Growing up, Jessica Fogarty (Class of 2015) spent a lot of time in the forest. Her interest in the natural environment was something she couldn’t ignore. Following her heart, she found herself studying Plant Science Technology with a specialization in Organic Agriculture at Dalhousie University Faculty of Agriculture. Now, almost three years after her graduation, Jessica has launched her own business that falls in line with her love for the forest. Fog Tree Forest Natural Products is a wild crafting and herbal business based on Cape Breton Island. Jessica uses wild harvest and locally cultivated plant species to create value added products. Her current products vary from salves, teas, tinctures, pressed leaf gift cards and bookmarks, herbal confectionary and so much more. Although Jessica didn’t grow up in an agricultural community, her interest in plant science sparked when she was young. She admits that the potential of farming or working in an agricultural industry wasn’t something she saw as realistic in her youth but she was always curious about living a rural lifestyle. The idea for Fog Tree Forest began to form when Jessica turned to a fellow herbalist for a recipe to cure her own issue. It was then that Jessica’s idea for Fog Tree Forest began to really take shape. Jessica explains that getting started was not necessarily an easy task. Once she had a rough idea of her business, Jessica conducted market research. She looked at her client base, competition and room for potential growth. She then began to develop her line of products, beginning with a product that wasn’t too extensive and then tweaking products based on sales and popularity. Jessica also began to establish her brand through both an online and local presence. She then developed a clever name for her business, a play on her last name combined with her memories of the times she spent at her grandparents’ house growing up. As a start-up business in its first year, Jessica currently works from home and focuses selling her products at the Cape Breton Farmers Market and Mabou Farmers Market. With plans to expand in the near future, Jessica is thrilled with the success of her small business in just one year. Not only did her community in Cape Breton adopt Fog Tree Forest and its’ exquisite products, Dal AC has recognized Fog Tree Forest and has distributed some of Jessica’s products at student events. 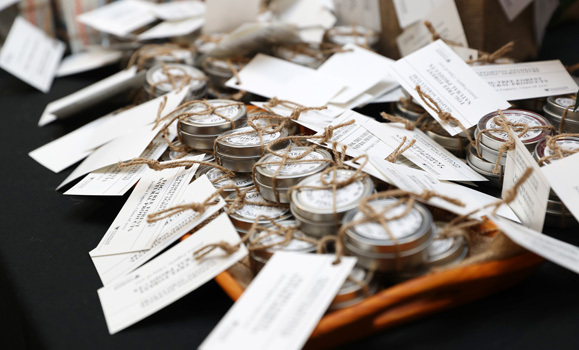 Farmers' Salve provided to donors and students at the Scholarship Banquet. Jessica is now looking to purchase her own property to be able to expand Fog Tree Forest. Her goal is to be able to cultivate a food forest focusing on indigenous and naturalized plants. She also wants to be able to offer her forest as a tourist destination, teaching environment for students and an acceptable venue for dinners, photoshoots, workshops or community activities. Although Jessica is clearly on the path to success, she didn’t get where she is today without her fair share of challenges. The many obstacles Jessica faced were overcome, but not without help. Jessica explains how Cultiv8, a program offering student’s access to industry mentors and entrepreneurial resources, was a valuable resource to her. With guidance from Cultiv8 mentors and access to valuable entrepreneurial means, Jessica was able to make her dream a reality. While she faced a few challenges along the way, she learned from her mistakes, persevered and is now on the path to what is sure to be great success.